We were matched with the big rivalry game - Clemson vs. University of South Carolina - which always takes place the Saturday after Thanksgiving. Even though it was a home game for us, the team drives 20 minutes out of town to stay in a hotel in Anderson for the night. It ended up being a 7 p.m. game, so we were told to be ready to leave at 2 p.m. Friday, and that we'd be with the team the entire time. We began by touring the football facility with Savannah Bailey, a grad student and overall amazing person who helps run the PAW Journey program (her title is "Director of Life Skills & Community Service, if that tells you anything). Unlike earlier tours I'd taken of the $55-million facility, Savannah's tour focused on the player experience - where they meet, train, eat, study, live - and how they are supported along the way. I was truly impressed by the PAW Journey programs and the focus on giving the players life and skills outside football - from internship options (tricky with NCAA rules) to etiquette classes to mission trips to financial literacy courses. We talked about football, but we also talked about students working to make the most of their college experience. We then boarded with the team onto buses. We were seated in the row of seats right behind Head Coach Dabo Swinney. Most players introduced themselves to us and shook hands, either on the bus or when walking around the hotel. 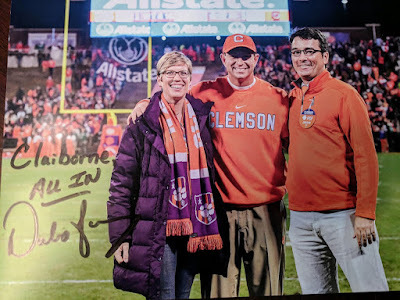 Dabo could not have been kinder in welcoming us and getting to know us (he seemed charmed that D. is from Clemson, so they had stories to swap). At the hotel, we were given nice rooms, a packet of information that the team carries (including detailed schedules and tickets), and told that we were allowed entrance into any meeting. The weekend was a combination of eating, meetings, eating, lounging, more meetings, more eating and some speeches. So Much Food was made available for these guys (and us). And at every meal, we were seated with Dabo and often some other coaches or coordinators, though not much of the staff stays with the team. We felt like royalty, always being escorted, introduced, and engaged with. Every coach and coordinator we spoke with was friendly, outgoing, and full of love and compassion for the players and their jobs. Dabo spent a lot of time with us, chatting like old friends, whether he was promoting his program or talking about stringing up Christmas lights with his sons. His interest in keeping the team focused on academics and cultivating a culture of family were not just sound bytes -- he seemed genuine, caring and focused on these goals, and his role in raising men. Just our being there was a physical representation of such values. We also attended chapel, which was interesting, and the offense and defense meetings, which were intense (and long). I was impressed by the detail, the jargon, the playbooks, the studying and the focus that goes into analyzing plays and discussing strategies. I honestly didn't understand 80 percent of what was said in the meetings (so many code words for plays), but I walked away humbled by how much these kids have to study and know and practice to master their sport. My opinions of the players vacillated widely between "they're just kids" and "what impressive men." When we watched Creed II at the movies (in a theater rented entirely for the team, with comped popcorn and slushies), the boys giggled and whooped through the intimate scenes, and I was reminded that many of them are still teenagers. But other times, players would approach D. to discuss their major or their plans for grad school, and I would be struck by their focus and maturity. Dabo shared that he witnesses that journey every year, from first watching recruits at age 16 or so to seeing them graduate in their early 20s. A lot of transformation can happen to a man in a strict football program during those years. And Clemson seems to be leading some impressive transformations. After waiting around the hotel room for hours (and visiting more meetings than I'm told they have for earlier games), we finally boarded buses to go to the stadium. The players were dressed in fashionable suits and had fallen silent to focus on the game. We were seated behind Dabo and next to Coach Brent Venables. The buses drop the team at the far end of the stadium parking lot so they can walk through the cheering crowds in what is known as Tiger Walk. I had known we would be in Tiger Walk, but assumed we'd be at the back. Nope. We were told to walk right behind Dabo. So the crowd of thousands of excited, cheering people parted for a line that was: police, Dabo, me (flanked by more police), D., Coach Venables, then the team. As we walked, almost everyone had their hands stretched out for high fives. They would extend them to Dabo, withdraw them with looks of confusion as me and D. walked by, then lunge them out again for Venables. It was crazy to both feel like a celebrity...but also realize no one cared a darn about you. I recommend never walking a red carpet between two very famous people. We were taken to the recruiting center, a big room with a few available snacks that offers a warm place for all the families of potential recruits to hang out. We had access to the sidelines for pre-game, which was an exciting way to realize how big that stadium is and how many people are involved in putting on a game. We watched the game itself from rather normal (but good) seats, and escaped into the recruiting center when we got cold. We left the game after the third quarter, as Clemson was winning by a lot, it was very late, and we were completely maxed out on football. Overall, it was a rather amazing and memorable experience. I am honored to have had an insider's look that I'm sure people would pay a lot of money to access. I was won over by Clemson's program, in that I truly think it cares about its players, cares about academics and future life success, and keeps the focus on family, love and fun -- even within the intense expectations. I hold these feelings in one hand while on the other I balance all my personal concerns I have with college football (including head injuries, lack of pay, expectations on players, etc.). Those concerns could fill up several more blog posts, but they're not the point of this one. I guess my conclusion is that while I have a lot of problems with college football, I firmly believe that Clemson is running an admirable program that many players benefit from. And they have a quality staff in place that has their priorities in order. Thus, when Clemson won the championship three days ago, my heart burst with a little more pride than usual. I was proud of Dabo for stepping off the bus to talk about the academic achievements of his players when most people expected a sports speech. I was moved by Christian Wilkins' tears of joy after having heard him talk about staying for two more years to finish his college years and be a leader for the team. I was amused to hear Dabo's sound bytes that I had heard him use in speeches I heard behind closed team doors. And I was so very happy to see a team win after I'd seen a little bit of how hard they worked and all that they sacrificed to be there. Thanks for a great experience, Clemson football. And thanks for that championship, too. Congrats you guys! You have a lot to be proud of and I love following along with you. Aloha, Irby. ChubWoolley. Great piece. From what I’ve seen and read, Dabo is the real deal. Best to you both.